Lady Florentia Sale (1790-1853), wife of Major-General Sir Robert Henry Sale, wrote a journal of her experiences during the First Afghan War. In January 1842, in what is usually seen as a humiliating defeat for the British army, 4,500 British and Indian troops with around 12,000 camp followers retreated 116 miles from Kabul back to the British garrison at Jalalabad. Within a month, the majority were dead from exposure due to the appalling winter conditions, starvation or bullet wounds. A few were captured, including Florentia Sale. She was held in captivity for nine months before being rescued by British forces dispatched from India. The British then withdrew from Afghanistan. Florentia Sale wrote her journal during her captivity, probably with the hope that one day she would publish it. In 1843, after her rescue, her journal was published rapidly becoming a bestseller in Britain. A sketch of her was included in the work. 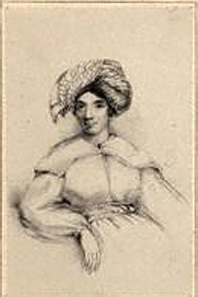 Notice that she is wearing a turban in the sketch. Source: Sale, Florentia. A Journal of the First Afghan War. Hamden, Connecticut: Archon Books, 1843.